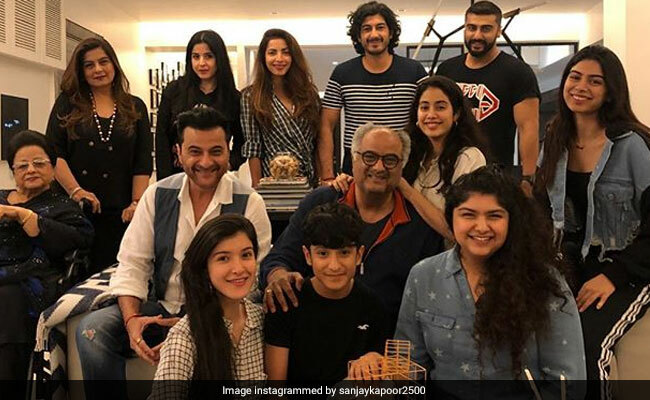 He accompanied it with hashtags "#brothersandsisters", "#keepsmiling"
Sanjay Kapoor is "looking ahead" to the New Year with the best memories spent with his family in 2018. On Thursday, the 53-year-old actor put together snippets from his family photo archive and shared it on his Instagram timeline. He accompanied the post with hashtags "brothers and sisters", "family", "keep smiling", "bonding" and "looking ahead". Sanjay Kapoor's latest post is all about siblings love. One of the photos in the collage features himself with his siblings Boney Kapoor, Anil Kapoor, and Reena Kapoor. Other pictures feature Arjun Kapoor, Anshula, Janhvi, Khushi, Sonam, Harshvardhan, Rhea and Mohit Marwah. The photo has been liked by, Anil Kapoor, Janhvi, Sunita Kapoor, Rhea, Mohit Marwah, Ananya Panday and Ekta Kapoor. Sanjay Kapoor is the youngest of the three Kapoor brothers. Reena Kapoor is the only sister of Boney Kapoor, Anil Kapoor and Sanjay Kapoor. Boney Kapoor, the eldest of the four siblings, is a film producer while Anil Kapoor, who is nine-years senior to Sanjay Kapoor, is an acclaimed actor. Sanjay Kapoor often delights his Instafam with million dollar photos from the family photo archive. Remember the then and now photo of the Kapoor brothers posted by Sanjay Kapoor? "Always by each other's side," the actor captioned the photo. Or a throwback photo featuring Sanjay Kapoor and his sister Reena Kapoor from the time when the duo were very, very small? On the work front, Sanjay Kapoor was last seen in Netflix anthology Lust Stories. He is currently shooting for The Zoya Factor, which also features his niece Sonam Kapoor, Dulquer Salmaan, Angad Bedi and Sikander Kher.